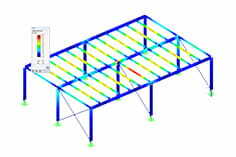 When calculating a horizontal bracing, the calculation is terminated with the message "System unstable in node 1, displacement in Z-direction. Check this in Window 1.1 to 1.11." What is the reason for this message and how can I finish the calculation? In the second iteration for LC 1 of your system, all tension members of the bracing subjected to compression fail. This also includes the diagonal of the middle span. This results in an instability of the system. As a test, replace the tension members by truss members, which can resist the compressive forces. If the total structure is stable, the problem is certainly the failing tension members. You can check the failure of the tension members also by running just one iteration step with the tension members in LC (specify this in the Calculation Parameters). Then, see the axial force in the tension members. To use the "Special handling" function for failing members, select on the menu "Calculate" -> "Calculation Parameters." The "Calculation Parameters" dialog box with the "Global Calculation Parameters" tab opens, where you can select the "Special handling" check box. If you select the option "Failing members to be removed individually during successive iterations," then after the first iteration not all tension members subject to a compressive force are removed at once, but only the tension member with the greatest compressive force. In the second iteration, only one member is missing in the stiffness matrix. Then, the tension member with the greatest compressive force is removed. If you use this option, only one tension member in the middle of your horizontal bracing is removed from the calculation, the other one remains but has the axial force 0.00. Thus, the system remains stable. An alternative method is to apply a prestress, which is a little greater than the compressive forces due vertical loads, to the tension members. 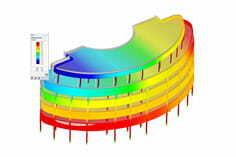 For the relevant load cases and the corresponding tension members, specify a prestress as additional member load and start a new calculation run.